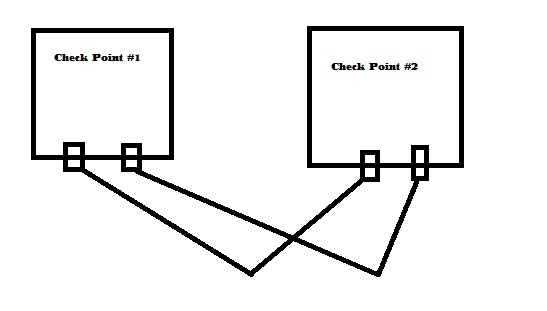 I wanted to write up a 'how to' on connecting sync ports in a Check Point HA topology. See the diagram below. 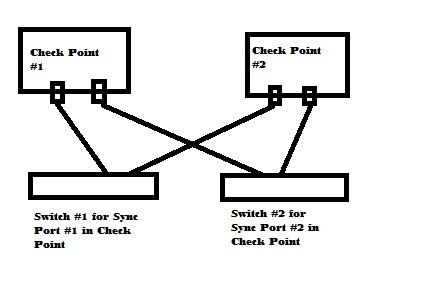 For both sync ports, you should connect each one (sync #1 and sync#2) to its own switch, in case one switch fails. Also, make sure you connect them to a switch and NOT a crossover cable to each other. If you use a crossover cable, and one unit goes down, the interface on the other unit also goes down. This can cause you problems and is undesirable. Make sure you ALWAYS use a switch when connecting sync ports together in an HA topology. Check Point TAC will always tell you to use a crossover cable. This is not the correct way to do this.